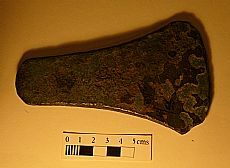 This bronze axehead is one of two found at Knockgranish near Aviemore, beside a large erratic boulder. The axeheads are of the so-called Migdale type (named after an early Bronze Age hoard from Migdale in Sutherland with axeheads and ornaments. They date to the early Bronze Age, c. 2200-2000 BC. After discovery, one of the Knockgranish axeheads was donated to Inverness Museum, and was only united with its pair 20 years later. Another early Bronze axehead (pictured to the right) was found in the vicinity at Kinveachy. Together these bronze axeheads show that wealthy inhabitants in the area were able to obtain or manufacture precious metal status objects. Moulds for such axeheads have been found in the Highlands, including on Culbin Sands near Nairn and in upper Strathconon. The reasons for depositing such axes have been much debated, with safekeeping and ritual gifts to the gods as the two main theories. The position of these two axeheads, placed carefully near a large boulder in the landscape, suggests that the latter may be the reason in this case. 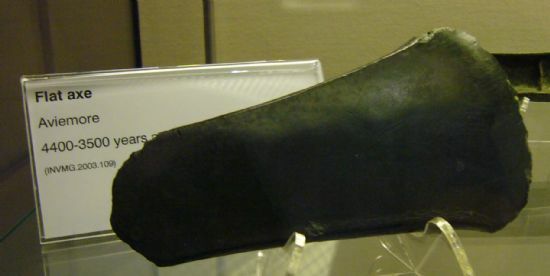 All three axeheads from the area are in Inverness Museum and Art Gallery, with one of the Knockgranish examples on display (labelled Aviemore). Cowie, Trevor 2004. ‘Special places for special axes? Early Bronze Age metalwork from Scotland in its landscape setting,’ in Ian A.G. Shepherd and Gordon J. Barclay (eds). Scotland in Ancient Europe. The Neolithic and early Bronze Age of Scotland in their European context, Edinburgh, pp. 247-61, esp pp. 255, with picture of findspot on p. 258. 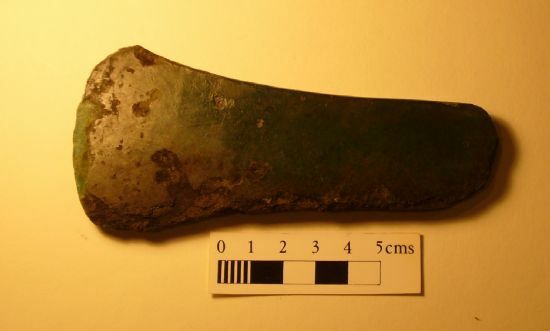 The axeheads were researched as part of the Upper Speyside Community Timeline class. Thanks to Trevor Cowie for answering a number of questions about the finds. See also Find of the Month March 2011 for a flat axehead from Auldearn.